Here is the pledge I took: “On September 17, I pledge to share a fresh, healthy meal that costs less than $5 – because slow food shouldn’t have to cost more than fast food.” I couldn’t agree more and am thrilled to know more than 5,000 meals are planned! I find this very inspiring, don’t you? As I contemplated what to serve for this fun challenge, I thought of various ingredients that can produce a hearty, inexpensive, flavorful meal. Frankly, with two teenagers devouring several meals a day, this is what I ponder on a daily basis! In general, combining simple ingredients such as quinoa, lentils, plain yogurt, pasta, eggs, rice, canned sardines, tofu, some cheeses, canned tomatoes and a host of vegetables like potatoes, carrots, garlic, greens and onions can yield delicious meals (shakshouka and pita, fried eggs with spaghetti, and linguine with tomatoes and sardines spring to mind as I’m writing). And, of course, shopping for what is in season provides fresh, cheaper produce. For this meal, I thought of cabbage, which is cheap and utterly delicious when transformed into kimchi. Mixed with brown rice and softly poached eggs, it’s a complete meal. And do you know how much it costs per person? $2.18! This is what I spent (per person) for the cabbage, brown rice, green onions, garlic, ginger and eggs. This does not include pantry staples I already had such as soy sauce, sriracha, vegetable oil, salt, rice wine vinegar, crushed red chili peppers and sesame seeds, but there is plenty of room in the $5 per person budget to buy any needed pantry staples, add another vegetable or even splurge on dessert. 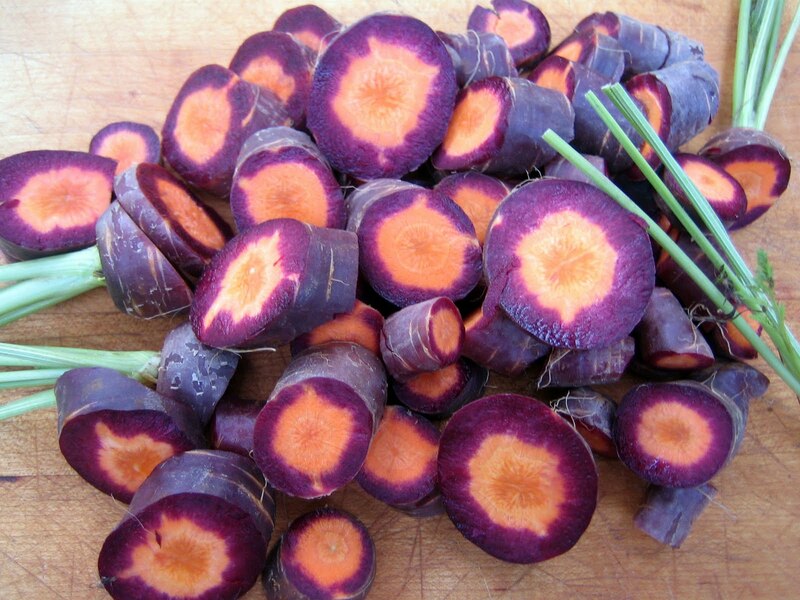 With this in mind, I will also be roasting carrots. These gorgeous carrots came in our CSA box, but at the grocery store I saw two pounds of carrots were $1.99, enough for four people. While at the store, I was tempted by a display of Theo chocolate bars at $2.89 each so I grabbed the dark spicy chile and dark toasted coconut for dessert. 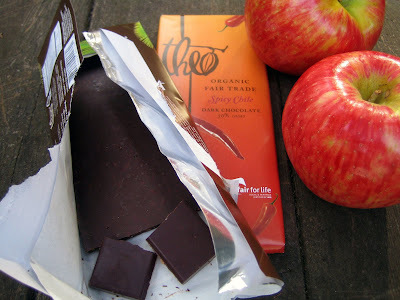 (Theo produces organic, fair trade chocolates here in Seattle and gives wonderful tours of their factory.) To round out the meal, I also picked up a couple of local Honeycrisp apples at $2.99/lb. 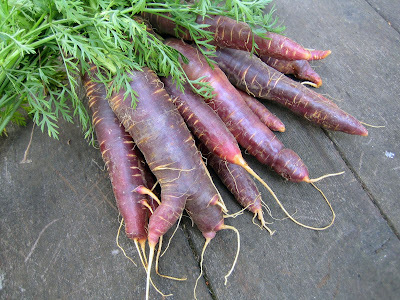 They are our favorite and are just coming into season so will be a terrific treat. And yes, I do realize that almost half the budget was spent on dessert! The total cost per person now? $4.62. Yes!! Eating slow food requires planning and preparation. It is not always quick, but often it is unattended (like this kimchi or a stew) and can use pantry staples so a lot of shopping is not required. Ultimately, eating slow food is rewarding, healthy, fun and tasty, especially when shared with others. I hope you are inspired to join me in this challenge! In a large bowl, toss the cabbage and salt together. Let sit for about an hour. Stir together the sriracha, vinegar, soy sauce, oil, garlic, ginger and chili pepper in a small bowl. Pour over the cabbage and mix well. Let sit for at least an hour and up to 4 hours. Mix in the green onions, sesame seeds and brown rice. To poach the eggs, bring a small pan of water to a boil and add a splash of vinegar. Crack an egg into a small dish and slip it into the boiling water. Immediately remove the pan from the heat and let sit for 6 minutes. Remove the egg from the water with a slotted spoon and set aside in a bowl of warm water until all the eggs are poached. To serve, arrange 1-2 eggs on top of a bowl of the kimchi rice. Garnish with additional green onions, sesame seeds or crushed red chili peppers if desired. I just made kimchi this week! It's sitting in my fridge fermenting! I'll have to share my recipe with you when I find out if it's good or not. 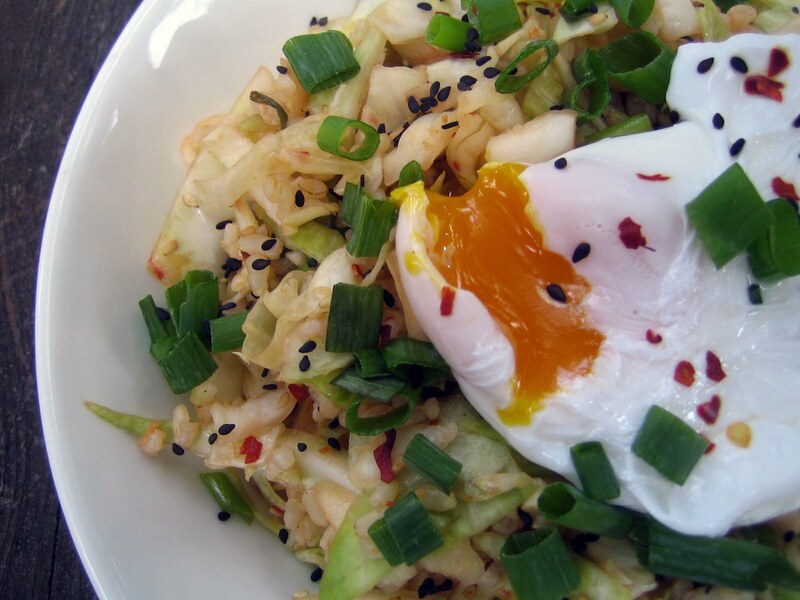 I will have to test out your kimchi fried rice recipe, sounds delicious! Thank you, Kate! This is a quick kimchi, and I hope you enjoy it. I'd love to hear about your kimchi! I'm just getting into lacto-fermentation and want to try more recipes. My first batch of sauerkraut didn't turn out as I'd hoped so I'm trying it again. Always fun to have a project! I was totally going to do a $5 Challenge post and then I realized--I don't know what anything costs! I usually enter the grocery total in our budget then recycle the receipts. I would be a terrible The Price is Right contestant. Oh, well! 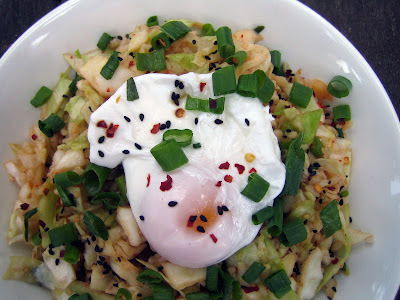 The Kimchi Rice looks amazing. I love finding new cabbage recipes! I love your quick kimchi! I have almost all the ingredients for this meal in my fridge right now, just need the cabbage. This will be a big hit with my husband. Love the $5 challenge! I didn't end up doing a post but we did enjoy a simple and inexpensive pasta with eggplant and tomatoes for less than $5 total! This looks really neat. For me it would not be a $5 meal, most likely because I don't have many of these ingredients. I really would like to try Asian food but it takes some effort to stock up the pantry--though really, it wouldn't be THAT hard...I love a dinner with eggs every so often. I have had Theos, as we visit Seattle each year to see my parents and we always make a trip to PCC (which is where I saw it? )...LOVE that place! What a great idea. I tend to keep a running tally in my head of how much a meal costs, especially during garden season, and it's sometimes surprising how cheap it is to eat well. Of course, that is assuming a stocked pantry. I have never made kimchi but always wanted to try. This recipe looks very simple. What a fabulous challenge! I can't wait to join. This is fabulous and your dinner looks incredible. I'm always on the hunt for less expensive food which still packs a huge amount of flavor. Don't you love how a runny yolk can make something cheap taste like it costs a million bucks? As for the planning, I couldn't agree more. With a little, and sometimes a lot, or planning you can seriously cut your grocery bill by buying things at their cheapest and not letting fresh produce go to waste. I am always amazed at the amount of food people throw out! I think in terms of the overall food budget, too, and I'm not always aware of how much an individual meal really costs. This challenge definitely motivated me to pay more attention...I was walking around the grocery store with my list and calculator! And I was happy to see how truly inexpensive this was in the end. Love the humble cabbage! Thank you, Katherine! I hope you enjoy it. Your pasta with eggplant and tomatoes sounds delish...can't go wrong with that combination! The kimchi rice is also good with marinated tofu, or I've served it with thinly sliced, grilled beef for my husband and sons (they are the meat eaters in the family). If you decide to try the kimchi I hope you enjoy it. Thank you, Dani! The kimchi is a simple recipe and, if you can start it earlier in the day, makes a quick weeknight meal. Ah, the blessings of a stocked pantry...I'm trying to teach my sons the value of this right now (it's never too early!). Thank you, Mikaela! This one does pack a lot of flavor and is very inexpensive. And I couldn't agree more, a runny yolk is definitely one of life's pleasures! I was looking at this earlier today and thinking how amazing it looks! Definitely plan to try it soon. YUM! Thank you, Lauren! I hope you enjoy it. What a fantastic idea :) I have never made kimchi rice but it sounds great, and anything with sriracha gets a tick from me, love that stuff. Thanks, Mairi! I'm hooked on sriracha, too. This makes a terrific weeknight meal if you start it in the morning (the kimchi can sit all day). We just had it again and I put some kippered salmon in...quite good!